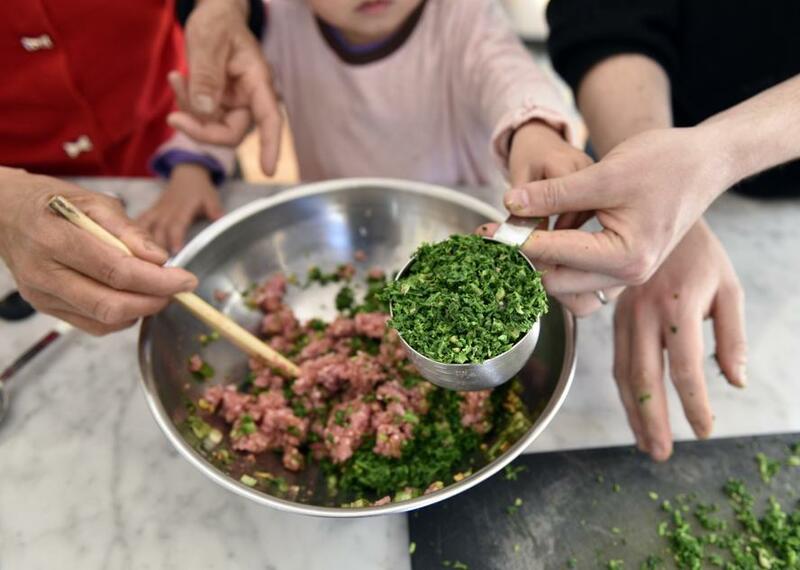 Ginger Chen (with granddaughter Stella Faulkner) puts foraged Shepherd’s Purse into dumpling filling. SOMERVILLE — Ginger Chen scans the terrain, a sharp knife at the ready. A wide smile spreads across her face as she spots something. She bends down, pokes the knife into the dirt, and wiggles loose a straggly plant. 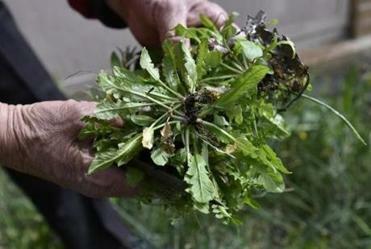 This is no ordinary, unwelcome weed. At the edge of this playground in an abandoned garden, Chen has struck gold — green, actually. The Chinese grandmother is foraging for qi cai (pronounced chee-tsai, or jee-tsai in northern China), also known as Shepherd’s Purse, a member of the mustard family. All but the very tip of the root is edible. Spokes of multi-pointed leaves emanate from the root, and they have a clean grassy smell, celery-like taste, and tender crunch. Later, Chen will blanch and chop the greens, mix them with ground pork and aromatics, and use this as a filling for dumplings. Shepherd’s Purse (Capsella bursa-pastoris in Latin) is popular among many Asian and Western cultures. Japanese cooks, who know it as nazuna, use it in a seven-greens rice porridge; in Korea, naengi, as it’s known, is part of highly seasoned salads. In Europe and this country, Shepherd’s Purse is a tisane and extract for a variety of ailments. 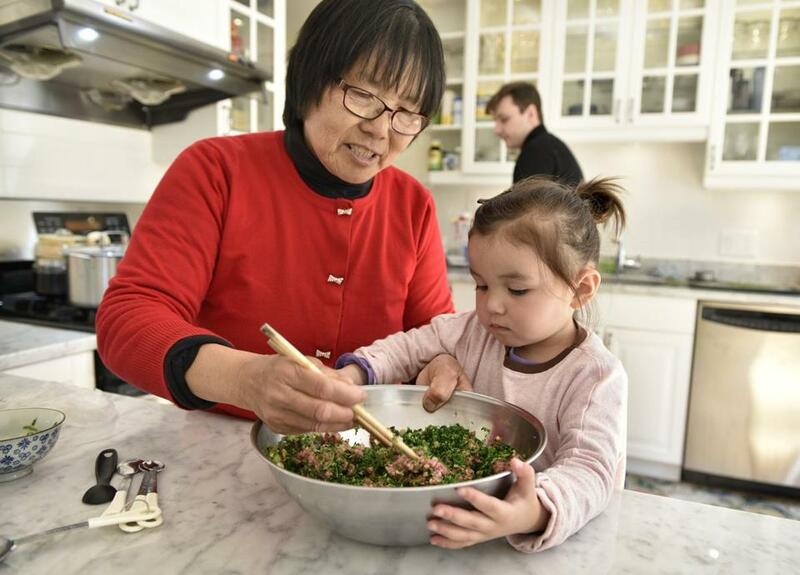 Chen, 67, whose Chinese name is Mei Zhen, arrived in Somerville 10 months ago from her native Chongming Island, located at the mouth of the Yangtze River near Shanghai. She came to help her daughter, Rachel Huang, and son-in-law, Jason Faulkner, when Rachel gave birth to Clio, now 8 months. She did the same when Stella, 2½, her first granddaughter, was born. Chen practiced all the Chinese customs for new moms: Rachel had to rest, eat gelatinous soups made with fish and pig’s feet, and never touch cold water. The grandma speaks no English, so Huang and Faulkner translate for a visitor. In the bright and spacious second-floor kitchen of their home, Chen fills the sink with water and thoroughly washes and drains the greens, then soaks them. She carefully slices just a bit from the root, leaving the green bundle intact, then lowers them into a pot of boiling water, and blanches them only enough to wilt them, but retain their brilliant color. Then she drains and refreshes them under cold water. The process is laborious. Now she scoops up a handful, squeezes out all the liquid, and sets the clumps on a cutting board. Huang, who is acting as kitchen assistant, chops them with precision. 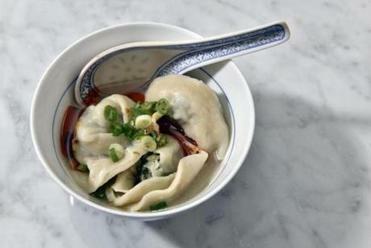 Ginger Chen makes her Shanghai-style dumplings with Shepherd’s Purse, available frozen in Chinese supermarkets in 16-ounce bags. Huang, 35, whose Chinese name is Yanping, met Faulkner, 32, through friends, when both were living in China in 2004. “We fell in love, traveled around China, and got married in 2006,” says Faulkner, who had gone to Shanghai on a study abroad program while at Bunker Hill Community College. “I liked it there so much, I dropped out of college, stayed, and taught English,” he says. He also learned to speak fluent Mandarin. The couple returned to Somerville, where Faulkner was raised, and bought a condo almost next-door to where he grew up. 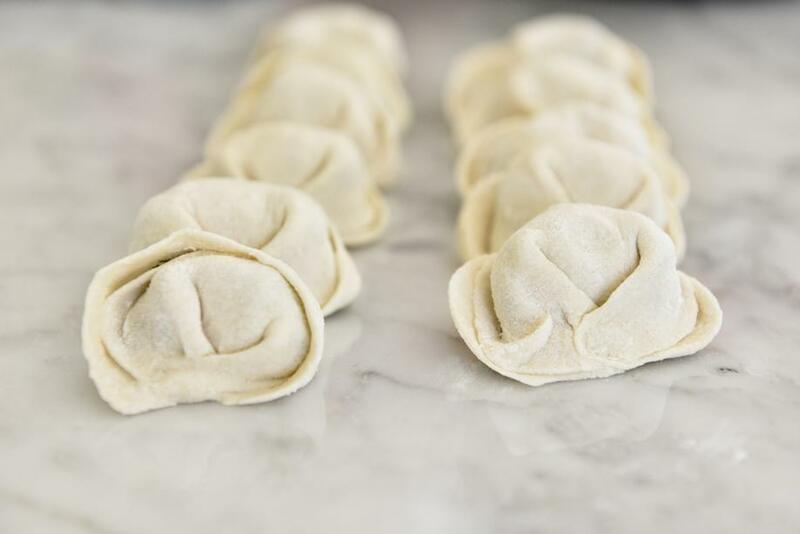 Ginger Chen is also making wontons, or dumplings, with her Shepherd’s Purse, which she combines with ground pork, soy sauce, salt, scallions, and fresh ginger. “It is important that the ratio of meat to greens is 50-50,” says Chen. In China, she explains, she buys dumpling wrappers, but in Somerville she makes her own. She flours the marble counter and kneads the flour and water dough. Stella, perched on a stool, helps her buwa (grandma in Chongming). Chen pinches off a plump piece and now Stella has her own real Play Doh, which she gleefully pats. Shepherd’s Purse is added to the mixture. Using chopsticks, Chen picks up a small portion of the ground pork mixture and places it in the center of a soft wrapper in her palm. She sets down the chopsticks, and uses her other hand to fold the dough over the meat into a half moon, and pinch the edges together. She sets the chubby packet down and, with precision and speed, makes her way through the remaining pieces of dough. She boils the dumplings for a few minutes, transfers them to bowls filled with sesame oil, salt, and scallions, and ladles some of the starchy cooking liquid over them. The velvety dough and clean green taste of the filling marries well with a black-vinegar and spicy black-bean dipping sauce. Chen doesn’t consider this an appetizer, like it might be in a Chinese restaurant. “I could eat 10 at one time,” she says. Shepherd’s Purse is almost past its season. Chen stops foraging when the greens produce little white flowers and seeds and they turn bitter. The shoots are also available frozen, but they lack the grassy flavor and bite of the fresh. Chen likes to take Stella on her culinary expeditions so they can dig together. With her experienced hands, she places the freshly dug greens, dirt clinging to the roots, into her granddaughter’s small palm, in an effort to pass on her knowledge and love. Some day Stella will make dumplings for her buwa. Rows of dumplings waiting to be boiled. Debra Samuels can be reached at dgsamuels@gmail.com.